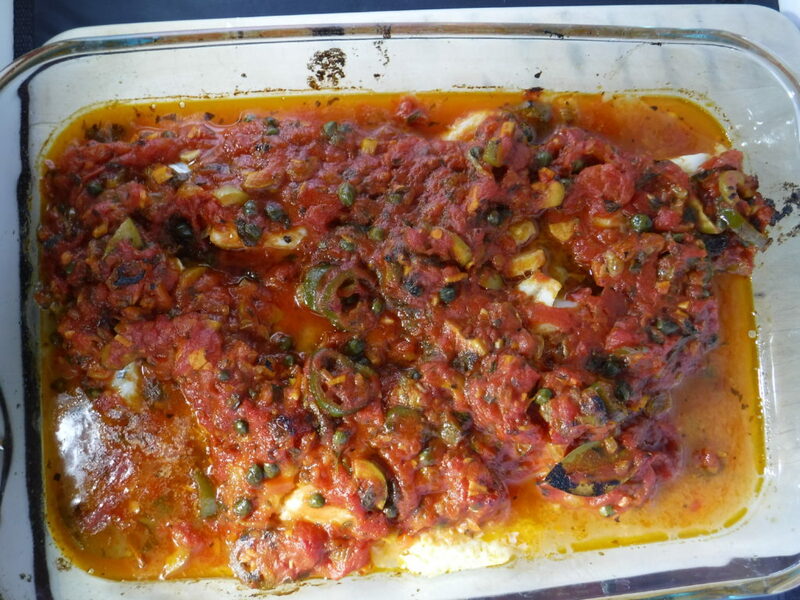 This is a Mexican classic, traditionally made with red snapper, which is easy to get on the Gulf of Mexico. In Richmond, it is not as common, so I used cod loins, which turned out well. This is one of those dishes which can be as spicy or mild as you like. I used about ¼ cup of pickled jalapenos, and Carol thought it was on the edge of too hot. This version is a little unusual, since it has raisins, which add to the complexity of the sauce. This version is adapted from a recipe in Bon Appetit in May 2003. The sauce can be made ahead. Open the can of tomatoes in a sieve over a bowl. By hand break the tomatoes into small pieces. Heat the olive oil in a large skillet. Add the onion, and cook for a minutes. Add the garlic, and cook for a minute. Add the broken up and drained tomato pieces and cook for a minute. Add ¼ cup of the tomato juices plus the bay leaves, parsley and oregano. Stir and cook for a few minutes until the sauce thickens. Add the olives, raisins, capers, pickled jalapenos, and the rest of the tomato juice and cook for about 8 minutes until thickened, stirring occasionally. Taste for seasoning. Take a lasagna pan, and put a few tablespoons of the sauce on the bottom. Spread out the fish fillets, sprinkle them with a little salt and pepper, and then top them with the remaining sauce. Bake about 18 minutes, until the fish flakes easily. Serve over white rice.